During my tenure at the Digital Scholarship Center my project, “Bronzino’s Net: Mapping Ducal Florentine Exchange and Art Production,” focuses on understanding the hidden life of paintings. It considers what happens between an object’s conception in the patron and artist’s imaginations and its final destination, often on the walls of a distinguished sixteenth-century person’s home. 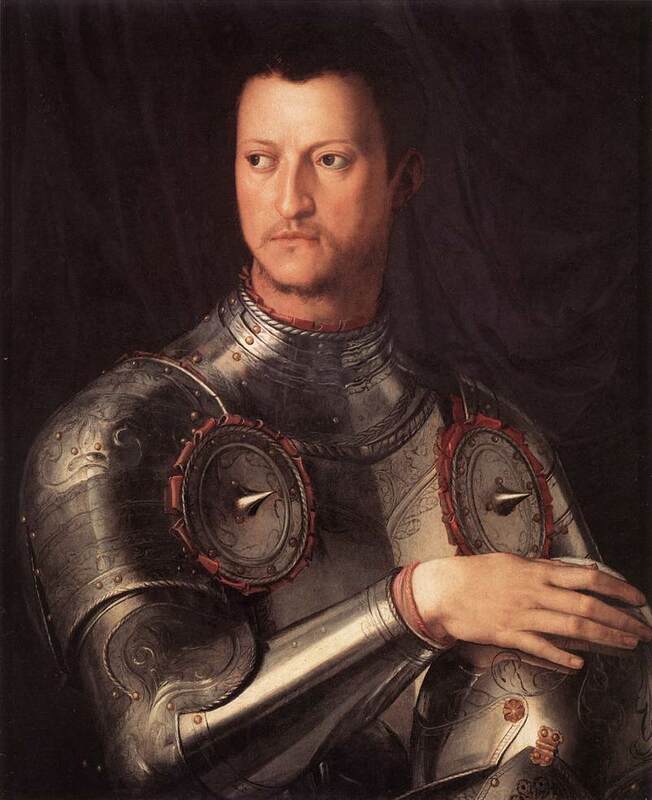 Bronzino was a sixteenth-century Florentine painter who worked for the ducal court of Cosimo I. His position required him to create multiple versions of the same painting in his workshop. The copies would be used in many different ways, including diplomatic gifts. Bronzino and his assistants painted up to thirty of the same portrait. These iterations would then travel across Europe. Through their movement they bound people together, effectively generating social and economic returns for the Florentine court. The underlying data that enables this project to flourish is called provenance. Provenance is the history of an object’s movement and ownership. It permits scholars to more deeply understand the contexts in which an object existed, consequently, bringing an object further to life. Provenance is not solely for scholarly exploration. The sheer value of art makes it a commonly looted/stolen good. Most recently, this has been a problem in the Middle East where ISIS has been selling antiquities stolen from museums to fund themselves. During World War II, many countries and people were stripped of their cultural heritage by the Nazis. Good provenances provide the opportunity to restitute these objects. Provenance data already exists for many artworks, but it is normally in a list on a museum’s website or in their ‘dusty’ files. In that format, the histories of objects are sedentary. Digital scholarship can serve to make provenance study more accessible. Multiple digital projects are currently attempting to resolve these issues, but Mapping Paintings stands out through its visually engaging platform. 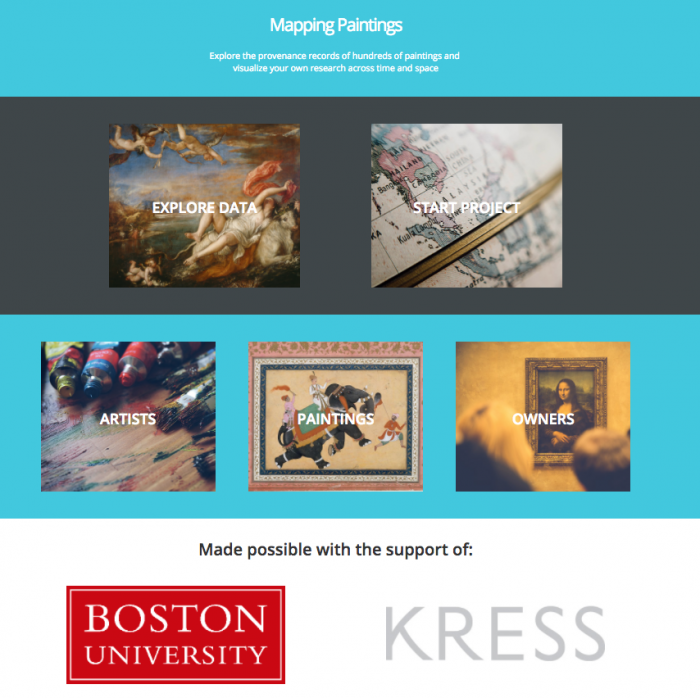 Mapping Paintings was created to expand the platform Mapping Titian to other artists. Mapping Titian collected and digitized the provenance data on the artist from catalogues and museum sources. On the customizable platform, a visitor is able to follow the movement of his paintings from their creation to present day. Mapping Paintings, sponsored by the Kress Foundation and Boston University, scaled up the Titian site. It is conceived of as a platform for scholars to make their own mapping projects without needing to learn GIS tools. Provenances can be visualized across space and time to understand how objects moved and, consequently, interacted with people and other things. In addition, the project is aggregating data through crowd sourcing. Although projects can be private, when a user adds provenance information to the platform and makes it public it is added to a global library. Jodi Cranston, creator of Mapping Paintings, will be visiting Temple University on November 28-29, 2017. On the 28 (Tuesday), she will be giving a lecture on the project at Temple Contemporary at Tyler School of Art from 5-6 pm with a reception following. On the 29 (Wednesday), Dr Cranston is giving a workshop at the Digital Scholarship Center from 1:30-3pm. I am excited for the opportunity to speak with Dr Cranston at her lecture and workshop, because Mapping Paintings both resolves and elicits many questions about undertaking digital scholarship. For example, although much of provenance data is easily plucked from catalogues, it is not the case for every object’s provenance. Sharing data that was hunted down by yourself is challenging in those cases. In my own research, some of the information I gathered was hard won, the product of hours and hours of scouring obscure books and catalogues. It is difficult not to have a sense of possession over it. I am also curious to know more about the normalization of the crowd sourced data. Since art historians deal with qualitative information, how is the project dealing with this issue? Even with my questions, I believe that crowd-sourced, searchable, and mappable provenance histories can transform the way we understand objects. In my next blog, I will continue discussing provenance problems and digital solutions, hopefully, including insights provided by Dr Cranston. Art Tracks a project by Carnegie Museum of Art: http://www.museumprovenance.org/ Carnegie is building a suite of tools to transfer written provenance records into searchable data.